A myriad of wildlife calls the ocean home, and the most innate human curiosities about them reflect the most fundamental questions that researchers must also answer: Why is this animal here, how long will it remain here, what will cause it to leave, and where else will it go? Without a basic understanding of the distribution trends of animals, management surveys cannot reliably answer other vital questions like how many are there and how is their abundance changing over time? Fortunately for researchers, technological improvements now make it possible to attach increasingly small devices to animals in order to track their movement patterns with relative ease for up to a decade. 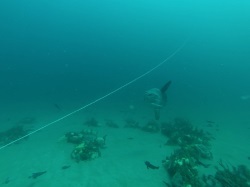 This field of research is known as animal telemetry and consists of three basic components: transmitters, hydrophones, and receivers. Transmitters are physically attached to animals. 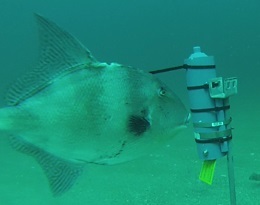 All transmitters send out unique signals using either radio (in air) or acoustic waves (in water), which are used to identify each tagged animal. Some transmitters also collect and convey data about the surrounding environment and/or the activity level of the animal. Depending on the body design of the animal, transmitters are either surgically implanted into the animal or attached to the outside of the animal. Hydrophones and receivers work together to hear, decode, and record the signals provided by transmitters. These devices can be manually-operated by researchers during active tracking of transmitter-tagged animals, but the greatest breakthroughs in the field of animal telemetry have come from remote tracking research. Remote tracking options include the use of orbiting satellites to monitor animal locations over time, as well as the establishment of listening stations at selected locations to document when tagged animals are in the vicinity. In 2010, the South Carolina Department of Natural Resources partnered with state management agencies in North Carolina and Georgia to deploy several hundred acoustic receivers in multiple river and estuary systems to monitor the seasonal occurrence of endangered Atlantic and shortnose sturgeon. 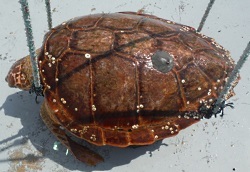 In 2013, multiple arrays of acoustic receivers were added to coastal waters off South Carolina and Georgia to complement inshore data collection for sturgeon, as well as to benefit other telemetry studies conducted by wildlife management agencies in both states. This website is intended to provide a summary of what (and when and where) species have been detected in these arrays (and how data are recorded) a result of expanded monitoring efforts.